Ooh! I am embarrassed to see how long it's been since my last post. Ack! Feels like "forgive me, it's been WAY too long since my last post..."
So much has happened since then! 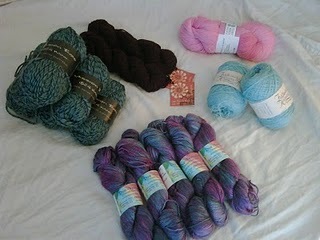 The biggest - that I've completely gone nutso for knitting! 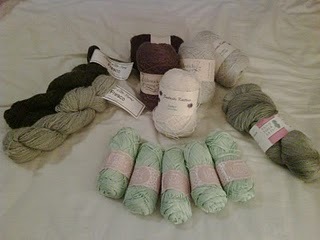 I'd just like to note that the 5 little balls of mint green cotton in the foreground of my stash pic are actually for my pal Es, who asked me to grab them for her at the last knit night, if they happened to be in the toonie bin (which they were). Unfortunately, that was all they had, so I grabbed it. I'm going to give it to her as a thank you for all the various knit night driving around she does for me - it's very sweet! And full disclosure, missing in my pic were also two books (Handknit Holidays, and Itty Bitty Toys) as well as a drop spindle kit for learning how to spin your own yarn. I am SO hooped...!